Well, you can’t, in my opinion. Bench seating is one of the most versatile ways to rest your weary bones in the garden and every garden, no matter how small, has room for at least one. If space is really restricted, a bench style seat takes up less space than a table and chairs and it’s also a good budget friendly option if you’re just starting out. Where there is more room to play with, it’s often nice to add a second, smaller seating area – this is something I often do when designing gardens, to get the most out of the space. 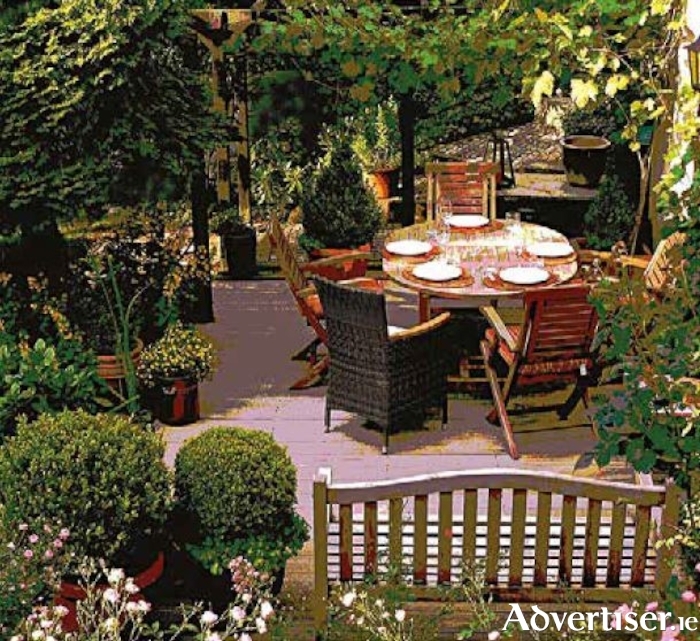 It’s a good idea for several reasons – you might want to be able to sit in different parts of the garden at different times of day, for instance, to take advantage of where the sun hits or indeed to seek the shade if that’s what you prefer. It’s also handy to have a few seating options for different family members depending on the state of diplomatic relations at any given time!! You will probably find that you use your dining set for – well, dining, and are more drawn to a bench seat when you want to relax for a while with a book or the newspaper. In garden design, you can use them in all sorts of ways – to form a focal point in a particular part of the garden, for instance, or as a destination or somewhere to rest for a few minutes in a larger space on a journey around the garden. Covered seats with trellis at the sides can be used to form a charming arbour with scented climbing plants trained around. You can make a statement with the style you choose and also in your choice of colour and materials. Speaking of statements – “this garden belongs to someone who knows how to chill out and relax” isn’t a bad one to start with. And a well- used bench seat says that loud and clear!